La Vibora: Right in Our Own Backyard! Living on one of Brownsville's beautiful resacas allows us to view many forms of wildlife, literally in our own backyard. Numerous species of insects, birds, mammals and even reptiles have taken time to visit us as they move along the natural corridors the resacas provide through the city. 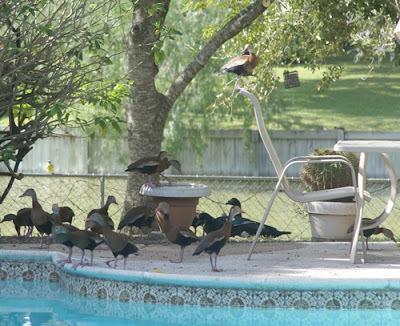 Our latest visitors are a large flock of Black-bellied whistling ducks. 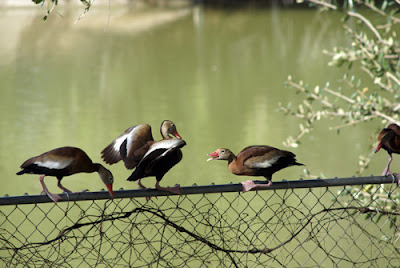 The Black-bellied whistling duck is native to tropical Central and South America and has steadily moved northward in it's range to deep south Texas. Sightings seasonally in the desert southwest and in southeast Louisiana are a welcome sign that their range and numbers continue to expand. This particular flock arrived on our resaca last week, just prior to our last cold front. What convenient timing considering I had just begun putting food in the bird feeders for our winter friends from the north. Now, without fail, they wait for me to put out food each morning. First comes the unmistakable noisy whistling that echos along the entire resaca. Then they congregate just outside the fence that separates the yard from the water (put up to keep BIG DOGS from tumbling into the resaca). They then take turns on the fence, almost jockeying for position. Finally, the procession begins into the yard, one after the other, until the entire flock is inside the fence. Now it really gets interesting. How do they get the food from a small feeder you ask? They actually take turns flying up to the feeder to tip it, spilling seed onto the ground. And several times, including today, I've found the bottom of the feeder on the ground. How they've mastered this technique is beyond me but with one lucky hit, the bottom drops out and the entire contents of the feeder is on the ground for the morning feast. I don't know how long this flock will stick around our yard but I hope they stay awhile. They're becoming braver day by day and have even come all the way around the pool to just outside the back patio where they watch me watch them. It's almost as if they're asking, "Can't you give us just a little more food?" Now that I think about it, it's a good thing Darlene works all day. She would probably already have them eating INSIDE the house, next to By-Tor! 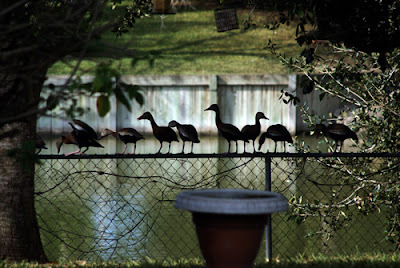 Early morning light casts a perfect silhouette of Black-bellied whistling ducks waiting for their daily feeding. 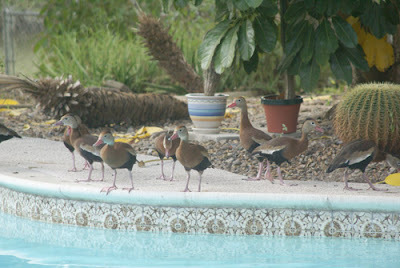 The flock converges on the pool. Note the two on the bird bath and the one on top of the chair! The unmistakable yellow breast and black mask of a Greater Kiskadee can be seen on the fence in the left of the photo. After emptying the feeder, part of the flock moves closer to the house, patiently waiting for a re-fill. Beautiful post, Baby! The photographs are all incredible and inspirational, though I am really drawn to the first one. Some of your backgrounds have an almost translucent quality that I have never been able to achieve. I would never thought of it on my own, but perhaps By-Tor would enjoy a pet ducky, or two! Thanks Dear. I like the first photo too. It was one of those lucky shots. I happened to be in the right place at the right time. Maybe we should just get By-Tor a rubber ducky to begin with. A rubber duck for By-Tor sounds like a good idea but it wouldn't offer very much warmth. Very nice post and the pictures are fantastic! It must be quite a trip to walk out to such an eclectic collection of wildlife every day. I do feel I have to correct you however. In one of those pictures, the bird you identify as a Greater Kiskadee (Pitangus sulphuratus), is actually a yellow-breasted, dark-maned, Deep South Texas Snapper (Pitangus Rgvus). Hopefully in the future, you won't repeat such an obvious error. These guys are one of my favorites. We love the pink feet and their cool colors. They just look sophisticated. If you recall, and for those you don't, we had several flocks when we in at Avocado Flats. We would hear them land on the rood and then settle in on one of the out buildings for the food. We had purchased a deer feeder and it went out at 0700 and the ducks were there. Of course, the rabbits and itty bitty birds, and doves and grackles were there also. Alas, we never had a deer??? We once saw a tree duck hook the back of his feet around the bird feeder bottom and was flapping his wings as he got food from the tray. It was the picture that got away. Leo snapped one, but it was not good. Both of us may not miss the house, but we do miss the yard animals and our tree ducks. Hey, if you can't find a rubber duck for By-Tor, I happen to know a guy that owns a rubber chicken he might be willing to sell!!! Nice post...great photos and very informative as usual. XXXX - Thanks for the compliments but I beg to differ on your identification of the yellow bird on the fence. While similar, the yellow-breasted, dark-maned, deep south Texas snapper is only found in and around HEBs. They can frequently be seen flying through the Produce Section while Mariachi Bands are playing on weekends. Beth & Leo - I did forget to mention that they use to be called Black-bellied tree ducks since they tend to nest in hollow cavities in trees. I've had a big nest box in the garage for years. I'm now inspired to position it by the resaca to see if I can get a pair of these guys to use it. Thanks for the comments! Steve's Girl - I find it hard to believe young Kyle would give up his RUBBER CHICKEN after all the grief we gave him about not owning CHICKENS. But then again, the one I gave him was more life-like. Have you convinced him yet that it's not real? Yes, X's knowledge of deep south Texas wildlife continues to impress and amaze me! His photographic memory of every deep south Texas snapper species and sub-species is truly a tribute to his countless hours of field research. I've never seen that species before - really cool! And hard to believe you get to see them in your yard. If she's not gonna let them in the house, the least Darlene could do is heat the pool for them so they won't have to hang out in that muddy, cold, unchlorinated resaca!